I grew up in the Piedmont, North Carolina, near Winston-Salem. My Grandma played gospel piano and country guitar that resembled claw hammer banjo. I was self taught learning from Doc Watson, Lightnin' Hopkins, Brownie McGhee. In high school I got a scholarship to the North Carolina School of the Arts and studied with Jesus Silva and Javier Calderon as well as attending some Segovia master classes. I also met Duck Baker and became interested in playing jazz and ragtime. I went on the road after high school in a funk band called Yesterday's Children playing Tower of Power, Isley Brothers, Stevie Wonder, etc. Landed in Minneapolis and met my future bride. I eventually formed a retro-swing vocal jazz band called Rio Nido which recorded three albums over the next 10 years. In the late 80's I traveled in eastern Europe and got turned on to Balkan and Gypsy music. Spent the next few years playing in Klezmer, Greek, Persian and Belly Dance bands while also playing straight ahead jazz including working with Brother Jack McDuff. My first solo CD was for Peter Finger's Acoustic Music Records, a solo version of the Nutcracker Suite. Guitar Bazaar and One String Leads To Another followed. This brought my work to the attention of John Zorn who invited me to contribute to his Radical Jewish Culture series on Tzadik with Neshamah, Tanz, At the Rebbe's Table and Masada Guitars, a project with Bill Frisell and Marc Ribot. I have two new CDs out this year. 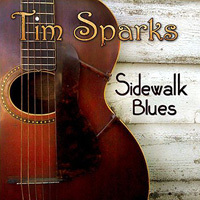 Sidewalk Blues is a solo fingerpicking homage to early 20th century Americana Roots music featuring Delta Blues, rags, early jazz and country gospel. The selections are culled from several sessions and locales over the last few years. Little Princess is a jazz interpretation of the music of Klezmer Legend Naftule Brandwein and features Greg Cohen on bass and Cyro Baptista on percussion. There are cool reharmonizations of Naftule's melodies with improvised solos that mix elements of jazz, blues, middle-eastern and flamenco. The ensemble playing is highly interactive. Little Princess was recorded February 18, 2009 at East Side Sound in NYC. For straight ahead jazz I played a 1949 Epiphone Zephyr Regent modified with a Les Paul humbucking pickup. I still have the 1954 Martin 00-17 I played with Rio Nido 30 years ago. I used that guitar on One String Leads To Another, Neshamah and Tanz. I used a Lakewood made by Martin Selligar on At The Rebbe's Table. Sidewalk Blues features the 1954 Martin, the Lakewood, a Collings Podium custom OM style cutaway, a 1917 Gibson L-3 found in a pawn shop in Chicago and a custom OM cutaway made by Charlie Hoffman of Minneapolis. I used the Hoffman guitar on Little Princess and that's the axe I am currently playing. I also have a Turkish Oud and Saz bought in Istanbul as well as an Enrique Hernandez Requinto, a Mexican alto guitar which I used on The Nutcracker Suite....and I won a Taylor Concert cutaway for 1rst Place in the Winfield National Fingerpicking competition in 1993, which I used on Guitar Bazaar. I usually play in a fairly naked, solo acoustic guitar setting. I like the Baggs M-1 sound hole pick-up, active version. That and a decent instrument mic usually sounds pretty good. Country, blues and gospel when I was growing up in NC, especially radio broadcasts with crazy preachers! I like everything, anything with soul....Doc Watson, Segovia, Wes, Jimi, Django, Chet, Sabicas....Kenny Burrell, Duck Baker, Ted Greene and Lennie Breau. Also Monk, Miles, Mingus, Bird, Trane, Duke and Fats. Very infuential album was 5 O'Clock Bells by Lennie Breau. I just got back from some gigs in the Bay Area which included a workshop and concert at the Healdsburg Guitar Festival up in the Sonoma wine country about an hour north of San Francisco. It's held every other year and features top luthiers from around the world. I overdosed on beautiful guitars and good music! I'll be going to Europe in November, December... and February of 2010.